Right now, Aaron Rodgers is playing the quarterback position at a level never before seen. He has a passer rating of 117.8 during this Packers’ eight-game winning streak. The first several chapters of this ongoing epic tale were fascinating because Rodgers, stylistically, was approaching the game mostly the same as he did during the 4-6 start to the season. With the exception of wins against Philadelphia and Minnesota, in which he was razor-sharp, Rodgers was still passing up easy completions in search of better options. He wasn’t working through his progressions smoothly or sometimes even in order. He’d break down in the pocket even when Green Bay’s stalwart protection had held up. The only difference was it was working; he was finding those big plays. Still, Green Bay’s offense lacked timing and rhythm. The problem with a heavy sandlot approach is that it’s inherently inconsistent. It’s only a matter of time until it hits a wall, and then there’s no foundation to fall back on. Indeed, that wall came in the first half of Green Bay’s wild-card game against the Giants. The Packers ran 21 plays for 29 net yards and zero points over their first five series. But then, to open their sixth series, Rodgers saw the Giants rotate to a single-high coverage and immediately threw a strike to Davante Adams for 31 yards on a go route. It was a quarterback’s instinctive reaction. With that, a switch was flipped and Rodgers was playing on schedule. Having suddenly located his timing and rhythm, Rodgers relied on it in the second half of that game and was unstoppable, even against a stingy Giants defense that tried everything. 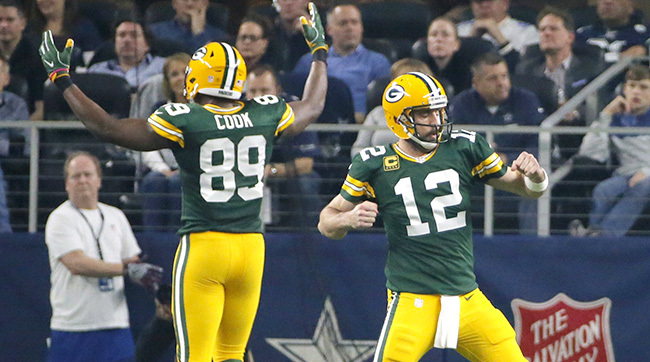 Rodgers maintained that timing and rhythm Sunday at Dallas. He’s a different quarterback now than what we saw early in the regular season—or even late in the regular season. The beauty is that playing on time and in rhythm does not come at the expense of one’s sandlot prowess. Rodgers can still call on those playmaking abilities when the situation demands it. Perhaps no play will ever testify to this more than Jared Cook’s incredible 36-yard catch to set up the game-winner on Sunday. Cook is the other difference between the Rodgers we’re seeing now and the one we saw for most of the season. Green Bay is 10-2 when the eighth-year tight end (and first-year Packer) has been in the lineup. It’s not just that Cook is a weapon in and of himself (though lately he’s been a great one). It’s that he gives this offense formational flexibility. Cook can line up anywhere: on the line of scrimmage; flexed a few yards out; in the slot; or out wide, including as the lone receiver on the weak side. This does two things. It allows other receivers to line up anywhere, creating more opportunities for the Packers to dictate favorable matchups and giving defenses more to prepare for. And it forces the defense to reveal its hand—especially when Cook is out wide or alone on the weak side. From those positions, the quarterback can tell whether it’s man or zone coverage simply by who lines up across from Cook. If he’s out wide and there’s a safety or linebacker across from him, it’s man-to-man (defenses almost always match safeties or ‘backers against tight ends in man coverage). If Cook is out wide and there’s a cornerback across from him, it’s zone. You can move around any tight end to reveal coverages, though it’s a different world when that tight end is a weapon (like Cook) as opposed to just a puzzle piece (like, say, Richard Rodgers). • GREEN BAY WEEK: Our series chronicling life on and off the field in one of the NFL’s most unique settings. You can imagine how knowing whether it’s man or zone coverage before the snap helps a quarterback play on schedule. It becomes much easier for Rodgers to anticipate defensive looks and throwing windows. And that’s amplified when you factor in Rodgers’ quick release and throwing velocity, which allow him to unload a beat early or late without compromising a play’s timing. He can maximize every opportunity a situation offers. The Packers next week face a Falcons offense that’s hosting the NFC championship because of an expansive, well-structured, precisely-timed aerial attack. The Packers will be there because their superstar sandlot QB has figured out how to run a show like Atlanta’s.